What can I say about this painting. THIS is probably my favorite one of all. I’ve struggled for so long to truly accept God’s love for me, deep down in the core of my being. I’m not sure why it’s been an uphill climb, but I have a lot of things that have played into my false belief of how I think God seems me at times. This painting is a constant reminder of God’s love — His fierce, unending, steadfast, deep, wide, high and long love — FOR ME! Today, my friend, I want you to know and understand how much God loves you. He really and truly does and will never, ever stop loving you, no matter what. Let’s lean into Him, listen to His heartbeat for us, and hear Him whisper this truth to our hearts. This is Day 23 of 31 Days of Art & Inspiration. Click here to read all posts in this series. If you missed my exciting announcements the other day, you can read about them here. Linking up with the lovely Beth today! So thankful it blessed you! Ooooh! I love the painting. It does truly capture the passion of God’s love for us- as much as anything can:) I think so many of us struggle with understanding God’s love for us- and any glimpse of it is just so encouraging. God bless! Simply beautiful my friend, such beauty and truth!! Okay I’m not sure how I’d ever pick a favorite when I love them all, but this…warms my heart! Oh how He loves us. I was so happy to see you link-up!!!! Love you. It was fun to be able to link up. I had to change the title of my post after I posted. So thankful it worked out. Have a blessed weekend! Wonderful! Love the painting just Beautiful….So glad I ran across your blog today….. I really love this one, too. It would make a great card and it’s certainly a wonderful reminder. Barbie, this is beautiful! Your words and your art!! Thank you Brenda! Always love to see your smiling face here. What strikes me first about your story and the artwork are the concentric lines, to me, signifying the work God is doing deeper and deeper in your heart as He takes His love down into that deep place… right to the core. It’s a tender place… and often so hard to let Him in. I’ve been there, too…. What a beautiful place you have here! 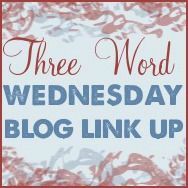 I met you at Beth’s for Three Word Wednesday. Have a great week! Thank you so much for stopping by Susan, and for your beautiful comment about my art. Thankful to have met you through the TWW link up! I LOVE the heart inside the heart inside the heart. It really does make me think of Father love for us and how He dives in deep to reach our core and pull us out of the depths of despair.